Powering your business growth through intelligent engagement. Today's sales landscape has changed. There's more information, more people, and more choices in this always on, mobile-centric world. As a result, today's buying process is more complicated than ever, with buyers who are more informed, independent, savvy, and highly influential. 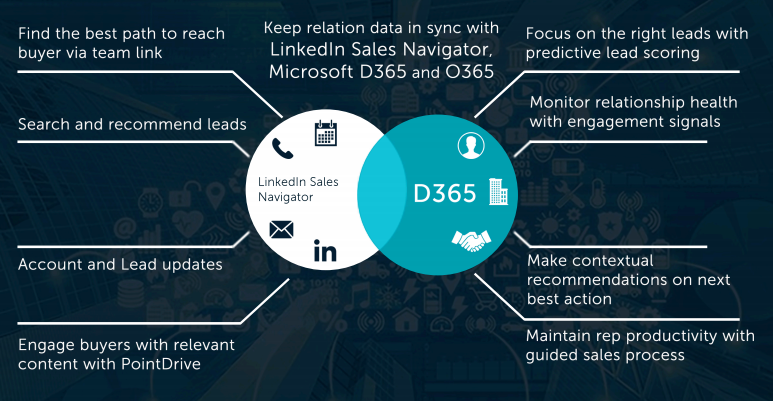 Go beyond sales force automation with the integration of Dynamics 365 for Sales and LinkedIn Sales Navigator, enabling you to better understand customer needs, engage more effectively, and win more deals. Relationship Sales - Identify and connect with buyers by tapping into the power of the LinkedIn network and easily manage relationships at scale with unified data and processes. Social Engagement - Easily find opportunities and engage buyers on social media with AI that highlights relevant conversations to join and recommends content to share. AI-Integrated Sales Assistant - Get alerts and reminders that help you build customer relationships. Know when to reach out to an inactive contact or a prospect who opened your email. Content Personalization - Get suggestions for relevant content based on what you are working on and who you are working with. Quickly create - and simultaneously collaborate and edit - documents with Office 365 tools. Sell More By Staying Focused - Maximize your sales team's performance by reducing distractions and helping them focus on the priorities. Brisc 365 brings the best implementation process from a team of consultants with rich expertise in the Sales and Customer engagement. The power of AI and seamless integrations possible with systems like email, single sign-on, collaboration tools take your relationship with customers to a whole new level. We ensure you reap the benefits of the out of the box features and insist on improvising only on the insights. Our Brisc implementation gets you up and running in a matter of 2 Weeks, while we bring your unique sales processes into your D365. Initial Setup - We set up the D365 system and perform main administrative configurations. Understanding business and sales process - Functional consultants shall share questionnaires, gather information about your sales hierarchy, access rights, sales processes etc. and document them. Data import templates and set-up - Load the system with your own data, sales roles and hierarchy. 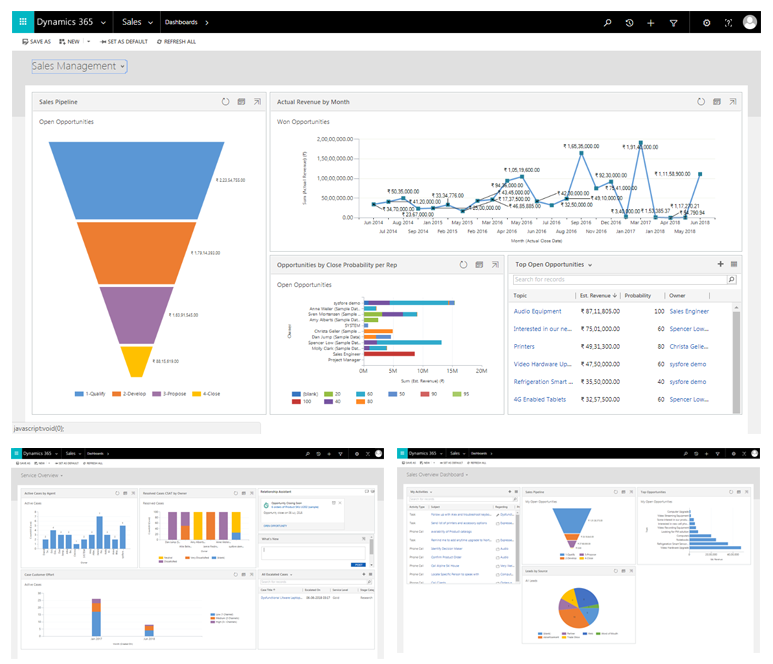 Configuration - We configure the D365 based on requirements captured. Customer Acceptance Demo - We demonstrate the configured solution and capture feedback. Iteration - Modification of the application based on feedback. We go through a couple of iterations until we are happy with the final solution. Go-Live - We make the D365 application live, after customer signs-off. Training & Support - We offer online sessions for user training, resolve issues and drive user adoption. Fully Configured Dynamics 365 System. Questionnaire & capture of specific configuration requirements. Focus on right customers with predictive scoring and relationship insights. Monitor relationship health with engagement signals. Make contextual recommendations on next best action. Maintain rep productivity with guided sales process. Proactively manage account and lead updates. Bring in transparency and excel in engagement. Work on any device and get the same experience. Integrate easily with any other systems with simple APIs. We want to hear from you. Contact us today to learn more about Brilliant Sales Connect 365.